A total of over 20,000 new units were launched across India’s top seven cities in 2Q17, while the corresponding number was slightly higher at over 26,000 units in 1Q17. A corresponding fall in unsold inventory was also recorded with the number of unsold residential units falling to ~4.2 lakh after 30 months. The last time India’s inventory overhang was close to this figure was in 4Q 2014, when it was slightly above 4 lakh. Inventory levels are expected to come down further as developers rush to register projects under RERA in states that have implemented. Developers operating in states which have not yet finalized their RERA rules continue to await further clarity. Remarkably, though, residential real estate continues to dominate the share of under-construction projects across India’s top seven cities. Across these seven realty markets, the value of under-construction projects in all three asset classes – residential, office and retail – is currently pegged at USD 236 billion. An overwhelming 85% of this under-construction real estate is in the residential asset class alone. Other cities contributed in single digit percentages. Compared to the 1Q17, the units launched in three markets – Mumbai, Bengaluru, and Kolkata – were higher in this quarter while all other cities saw their share in units launches reduce. In 2008, it was the global financial crisis that caused real estate developers to curtail supply on the back of reduced demand. 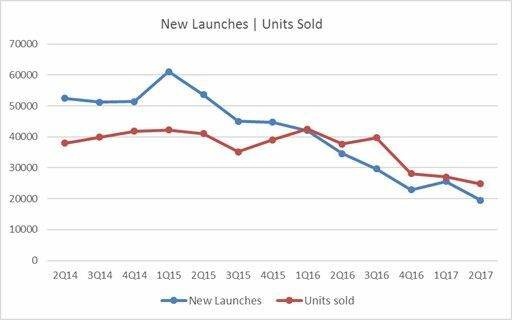 This time around, builders are intentionally bringing down the inventory overhang across markets by reducing new units launches. Indian realty markets are maturing in the face of the evolving supply-demand realities as well as the improved policy framework. This bodes well for not only the industry – and especially for home buyers – in the long run.